Create an exception with the invalid query. 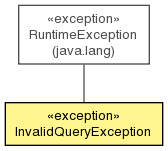 Create an exception with the invalid query and a message. Get the XPath query that is invalid.